Did you know 55% of Americans celebrate Valentine’s Day and spend an estimated $18.2 billion a year? Make the most out of this gift-giving holiday with Teespring. Check out our top tips for trending design themes, optimizing listings, and capitalizing on cutoff dates. Teespring’s Boosted Network gets your products in front of millions of shoppers around the world by listing them in marketplaces like Facebook, Amazon, eBay and Wish. 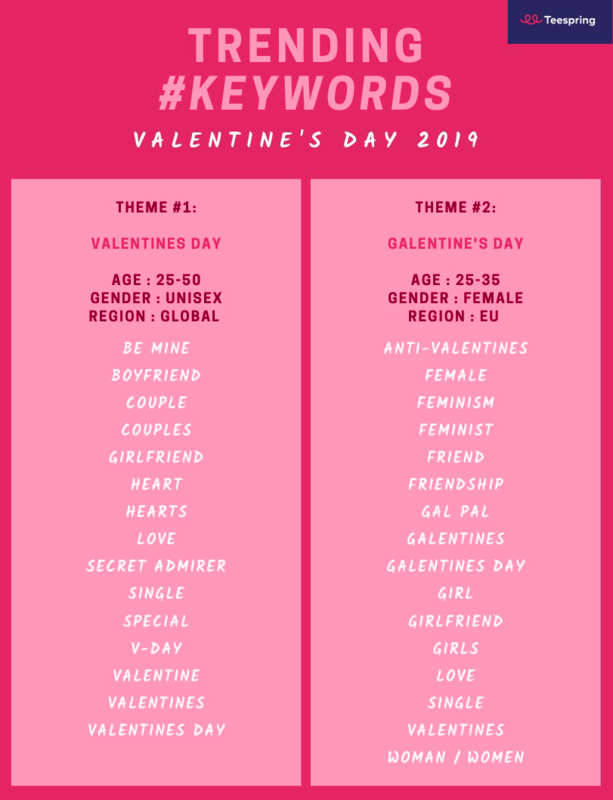 Our Boosted Network Trends Team have compiled their top keywords and themes for Valentine’s Day 2019 based on marketplace performance—we hope it can help inspire your next listing! 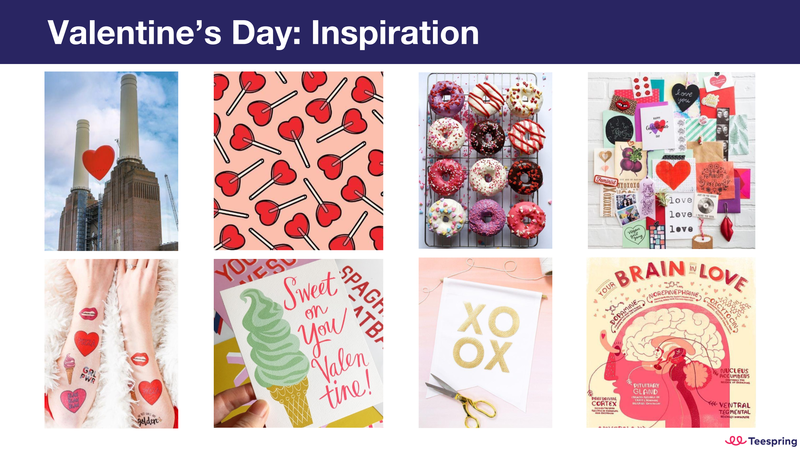 Check out this mood board for examples of how other sellers are incorporating these themes into their product designs. Make sure to use relevant keywords in your listing titles and descriptions (learn more below). Using relevant keywords in your titles is vital to getting your listings discovered by potential buyers. Use our optimization tips below to help your listings get more sales and exposure through Google, the Boosted Network and Teespring Marketplace. Do describe your design, the design theme, and/or your intended buyer (who is the design for). Do use correct grammar and punctuation. Do be specific and accurate. Do incorporate keywords you think a shopper would use while searching for your product. Do include the most important information in the first 150 characters of your description. Don’t add the product type in the title. Teespring will automatically add the product type to listing titles that are added to the Boosted Network. Don’t use capitalized letters for emphasis—this looks spammy (i.e. don’t write BEST SHIRT EVER). Don’t include comparisons or details about other products or designs. Don’t include promotional text that isn’t related to the product (shipping info, delivery, price, payment options, limited edition, etc.). 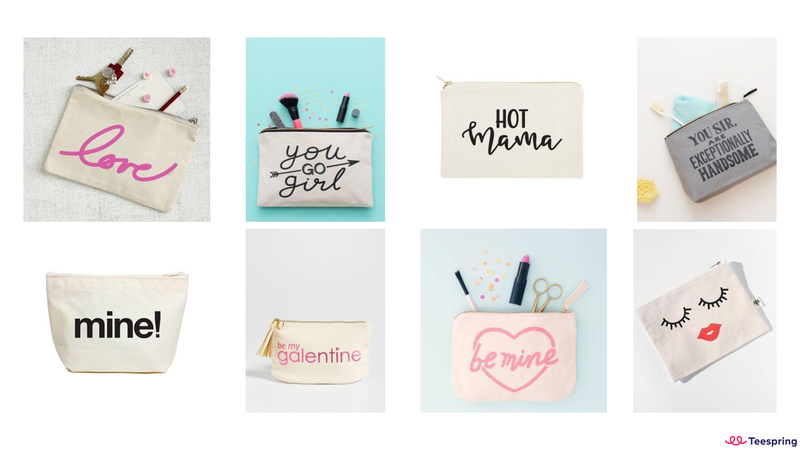 Accessory pouches & totes make great, personalized Valentine’s Day gifts. Keep in mind new products (like accessory pouches) are being rolled out to sellers on a case by case basis. Your trust score and sales history impact your eligibility for new products like hats, die-cut stickers, etc. Use Teespring’s Buyer Message Tool to offer past buyers a new and exciting product that feels personalized just for them! Shoppers usually spend an average of $50 on their family. 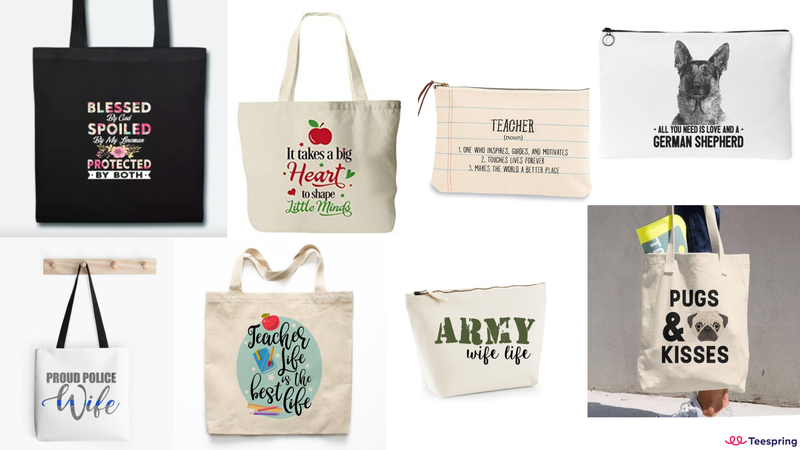 Many gifts will also go to teachers, colleagues, and friends. 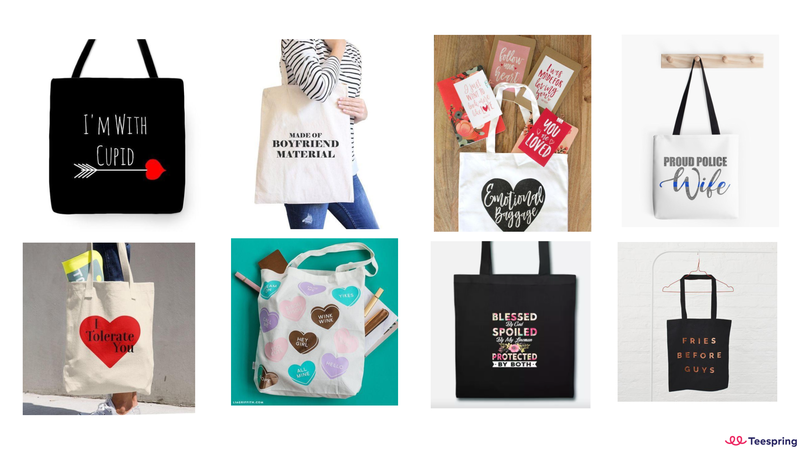 The key here is to personalize the design message of your products in a way that resonates with your target audience. So think hobby or career related designs—these niches are a good place to start. 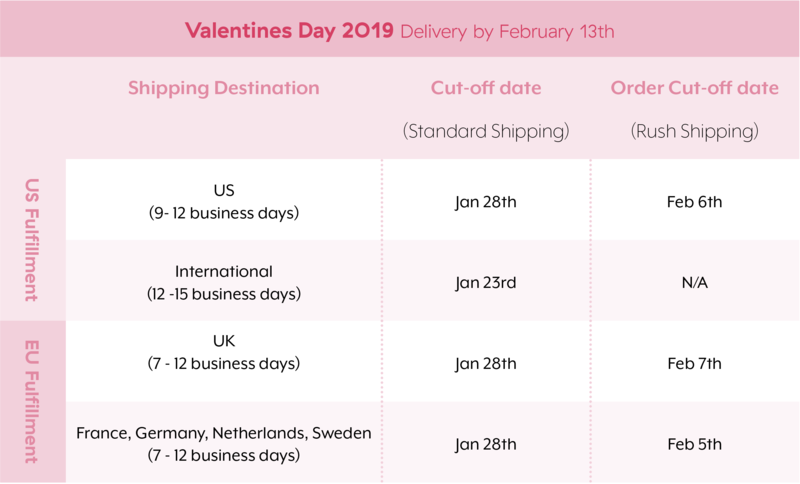 Below are the cutoff dates for 2019 Valentine’s Day delivery. 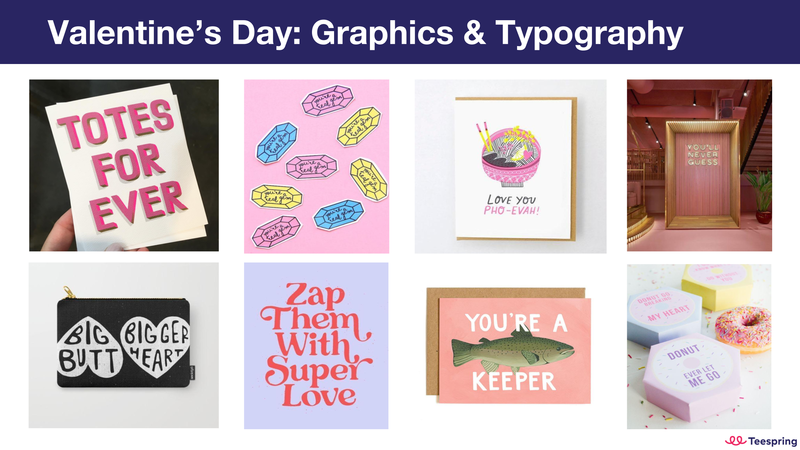 Once we’ve passed the standard shipping cutoff dates, buyers can still receive their products in time for Valentine’s Day—they’ll just need to select ‘rush shipping’ at checkout. Plan to initiate your listing’s print cycle on the standard shipping cutoff date to ensure shoppers get their order by February 13th. For rush shipping, the buyer just needs to place their order by the “order by date” listed below. Don’t forget delivery timelines are usually faster than indicated above, but to be safe we’re suggesting the largest delivery window for calculating cutoff dates. Most importantly, make sure you’re offering rush eligible products in your listings!